TunnelBear comes with a number of privacy features. With their secure encryption, you can be sure that your data will stay safe from hackers and spies. Along with the typical and desired VPN features, TunnelBear also offers Ghostbear, a stealth technology that disguises your OpenVPN traffic to bypass firewalls. This technology will let you circumvent even the Great Firewall of China. This is an amazing feature and lets TunnelBear stand out from the crowd because not many VPN providers can help you bypass the Great Firewall. While they do offer good speeds, the problem is, they don't unblock Netflix. Also, they don't allow P2P, which means you cannot torrent your favorite movies or shows. This makes them a pretty useless VPN for movie lovers. TunnelBear is based in Canada which is a member of the Five Eyes spying country. However, they don't keep data logs on their customers, so it might be safe to use their service. While they offer feature-rich services, their prices are relatively low. They even offer 500MB free per month. They do not have a money-back guarantee but you can use the free VPN to test their services. The free service gives you access to all the paid features. If you don't use VPN frequently, you'd be okay with the free plan. However, if you're a seasoned, regular VPN user, it's best to upgrade to a paid plan. The paid plans are available at a month-to-month and one- or two-year packages and the prices are industry average. Their user app has a nice interface and the graphics are friendlier than those of most other VPN apps. And you can use the VPN simultaneously on 5 devices, which saves users money on multiple accounts. Tunnel Bear has IP-address leak protection, as well as a kill switch to make sure your details are not exposed even if the VPN connection drops. With such features, TunnelBear is pretty secure to use and offers complete protection from hackers and government agencies. TunnelBear has the looks of a good privacy tool. Plus, it's a part of the McAfee team, which is a big name in internet security—and being a part of McAfee speaks well for TunnelBear. TunnelBear doesn't offer live chat support, which can be a problem for some users. Most people look for quick solutions as soon as they face a problem. While they don't have a live chat feature, they do have an extensive knowledge base and you might find answers to your problems there. Their knowledge section has information about their services along with their latest announcements. You can contact them through their online form and they'll reply within a business day. They are also active on social media, but if you contact them there, they'll redirect you to their ticketing system. While their replies aren't too long, a live chat feature is always better than ticketing. TunnelBear lacks in this aspect. There are three plans — Little, Giant, and Grizzly. That's not a joke: Those are actually the names of their three plans! Little is a free plan that offers 500MB data every month. It's enough to test their services but not enough to stream content or even for regular browsing. Little is basically a test plan that gives you a flavor of their services. Giant is the monthly plan. You get the same services as Little except now there is no limitation of 500MB. You can access as much bandwidth as you want. Giant is moderately priced and very affordable. Grizzly is the yearly plan. While Giant is priced competitively, you can save 50% more (averaged per month) with Grizzly, and you pay the fee annually. Grizzly also offers unlimited data and bandwidth. There are no money back guarantees, so you won't be able to get a no-questions-asked refund if you're not happy with their services. To make sure that doesn't happen, you can try their free plan for some time before you subscribe. TunnelBear can also be designed for teams. You can contact their customer service and they will create a special plan for your business or team. On the Team plan, you'll get a free trial for 7 days. Payment modes are limited to credit cards and Bitcoin. While crypto will allow you to be anonymous, most people still prefer PayPal and it's not a listed method on TunnelBear. TunnelBear has apps for Windows, Mac, Android, and iOS. It also has browser extensions for Chrome, Firefox, and Opera. It can also be configured on other platforms including routers and Linux. The apps are very easy to use. If you're a novice VPN user, you'd be happy with their apps. The interface is friendly and the graphics are engaging. The speeds are good enough for streaming video content and gaming. If you don't want to install the app, you can use the browser extension instead. However, keep in mind that when you use a browser extension, your entire session isn't protected. Extensions will cover only the pages that you access through that browser. TunnelBear cannot unblock Netflix. Also, you won't be able to torrent, because P2P is not allowed on it. So, if you're a movie or TV lover, this VPN might not have many options for you. But the good news is that they can bypass the geo restrictions of China, which not many VPN providers can do. TunnelBear doesn't log your IP address or the websites visited by you. However, they do collect some data such as your email address, operating system, and credit card details (if paid through a card). If you don't want them to store your card details, you can pay through Bitcoin. While TunnelBear is located in Canada, it might turn away some users since Canada is a part of the Five Eye countries. However, since they claim that they don't keep logs, you may not be risking your privacy if you use TunnelBear. 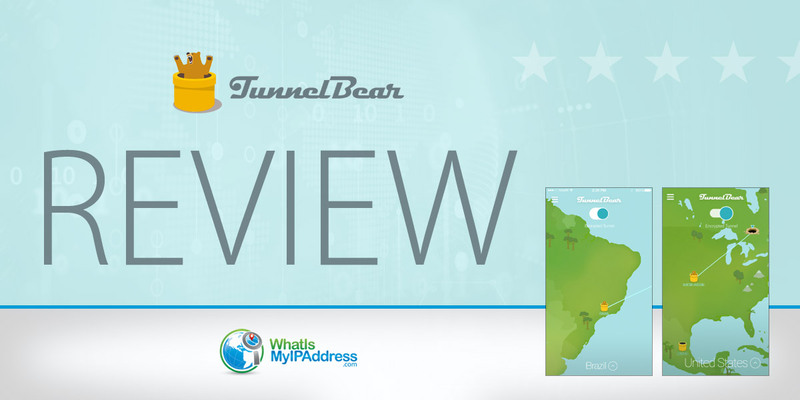 TunnelBear is a popular VPN service that's now a part of the MacAfee family. It offers a secure VPN service with high speeds and easy to use apps. They also have a free package that lets you use 500MB each month. While they don't have a money back guarantee, they do allow refunds depending on the case. So if you've paid for the VPN but couldn't use it because of a technical issue, you might just be eligible for a refund. One great thing about it is that it can bypass The Great Firewall of China. If you're planning to travel to Beijing, you can hide behind their Ghostbear technology and access the free internet without any issues. The prices of TunnelBear are the industry average and affordable, and because you can use the VPN on 5 devices at once, it's a pretty inexpensive deal. The free trial of TunnelBear is enticing, but the 500MB limit can be restricting, so most users move to paid packages. TunnelBear is headquarted in Canada, and while this can be considered a negative point, based on the legal ramifications of government investigations, the good thing is that they don't log any usage data. TunnelBear operates on OpenVPN protocol and AES-256 bit encryption. This is the most secure encryption and is practically unhackable. But they don't just offer OpenVPN. They also have other protocols, including IKEv2. The paid version of TunnelBear's VPN service doesn't leak your IP address. It features fast speeds and lets you stream your favorite movies and shows, although it doesn't unblock Netflix. Also, it doesn't allow P2P so you can't exactly torrent the movies and shows you want to watch. Over all, TunnelBear is a respectable VPN that offers good services, especially if you want to visit China. While their server network is not huge, the have servers in only 20 countries, you can nonetheless hide behind a number of IP addresses. And since they're now a part of the McAfee family now, they have more users before. So, whether you want to stay secure on public Wi-Fi, or just want to stay anonymous when you're online, TunnelBear will be there for you.